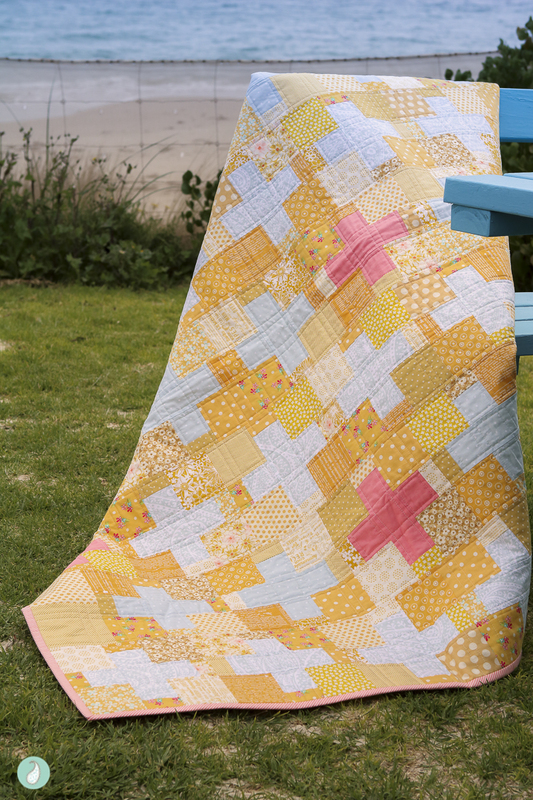 When the Thimble Blossoms Swiss Quilt pattern was first released, like many others, I was immediately drawn to it! The traditional combination of red and white was striking, and the simple piecing was immediately appealing. My version turned out to be a little less traditional, and a little more retro – but I think there is a lovely sense of nostalgia to it :). I began this quilt in January 2016. Being the first project for the new year, I was excited to piece something simple. I knew the hardest thing would be choosing what colour fabric to showcase! 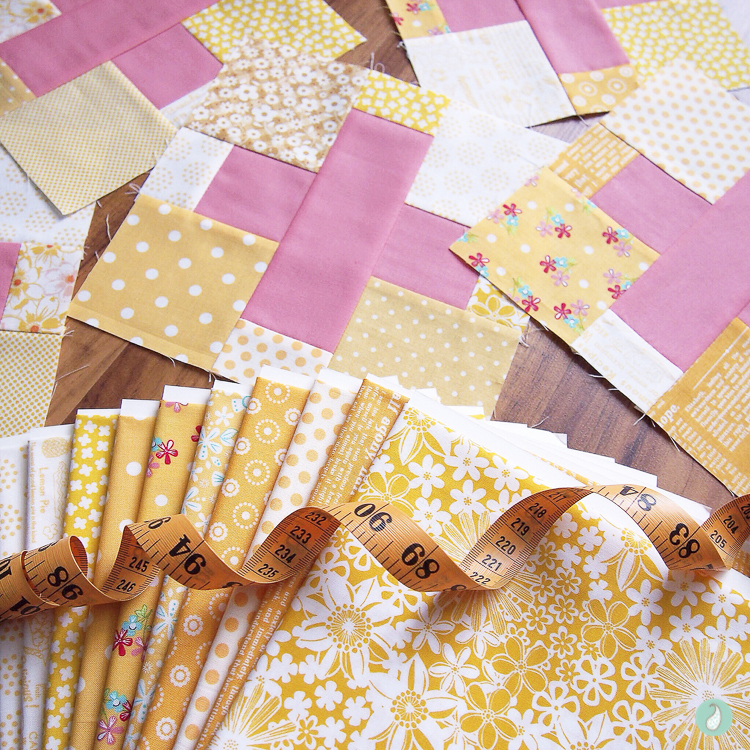 First, I considered an aqua version, and then pink; but when I went to my stash to see what I had the most of, I found I had a growing collection of yellow fabric that might work. 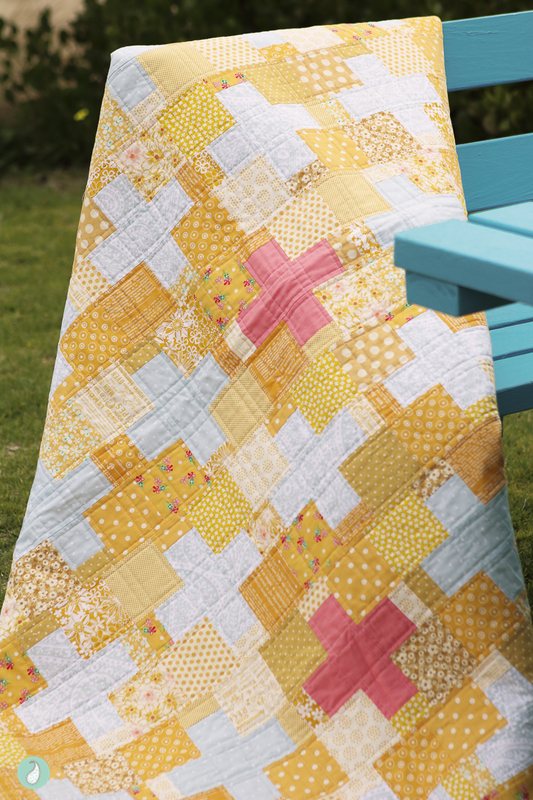 I love yellow, and if nothing else, I decided a yellow Swiss Quilt would undoubtedly be unique! 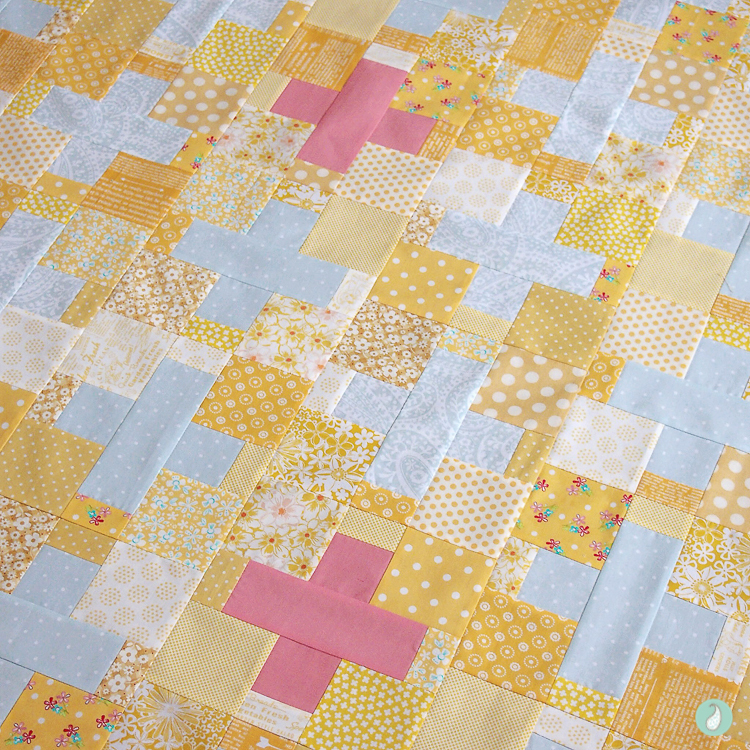 Since the quilt was designed to be scrappy I was determined to use fabrics that I had on hand. Rather than cut into some white solid fabric that I could use elsewhere, I decided to use these subtle aqua prints as the centre of the plus quilt block. One is a polka dot, and one is a paisley print – my perfect pair!! As much as I loved the aqua, I didn’t quite have enough for all the blocks. I contemplated trying to find a solid in a similar colour to the aqua prints, but I knew that was going to be difficult. 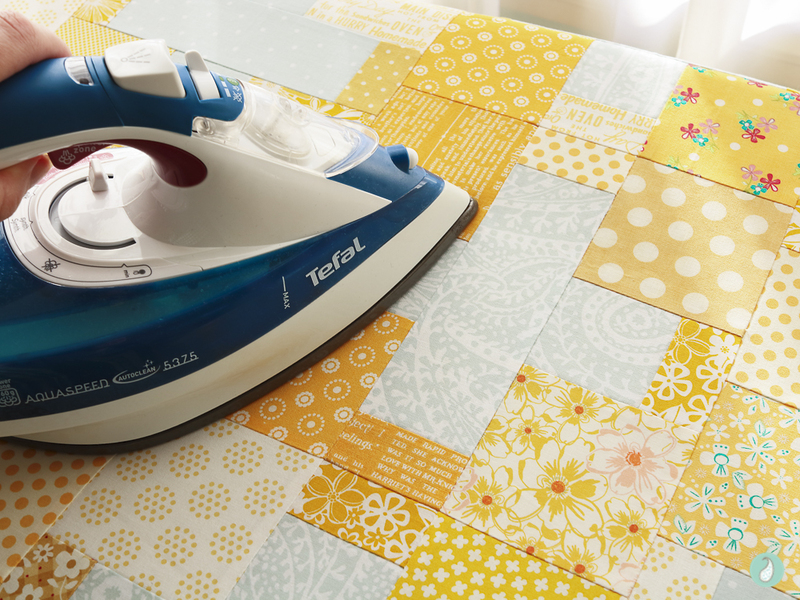 Rather than stress over it, I decided a splash of colour would give the quilt a subtle creative twist. 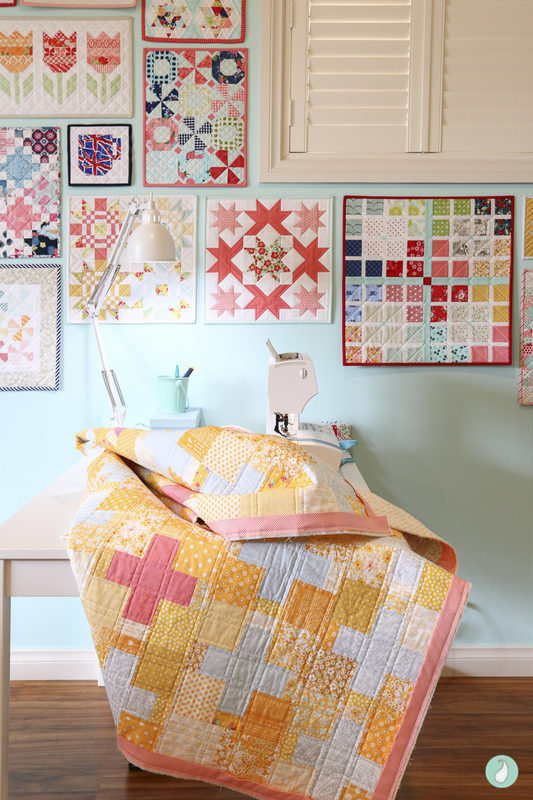 Pink seemed like the perfect accent, and gave the overall quilt a sweet, youthful 70’s feel. It wasn’t until winter was about to set in more than a year after I first began to piece the quilt, that I pulled out this bright quilt top and decided to quilt it. I found the perfect yellow polka dots for the backing!! A pink bias stripe binding was the perfect finishing touch :). 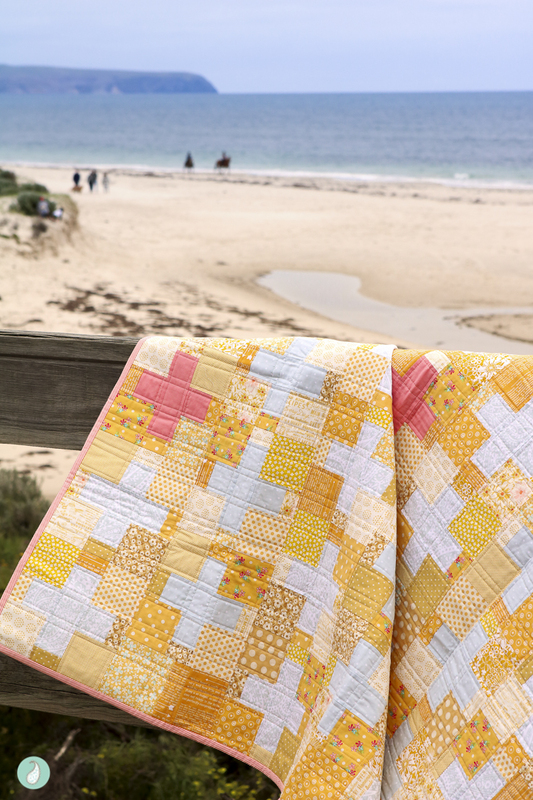 This quilt really is sunshine on a cloudy day! My preference is to hand-bind my quilts, which occasionally means they sit in a pile waiting for me to make time to sit and stitch them, but I am always glad I take the time to do this. 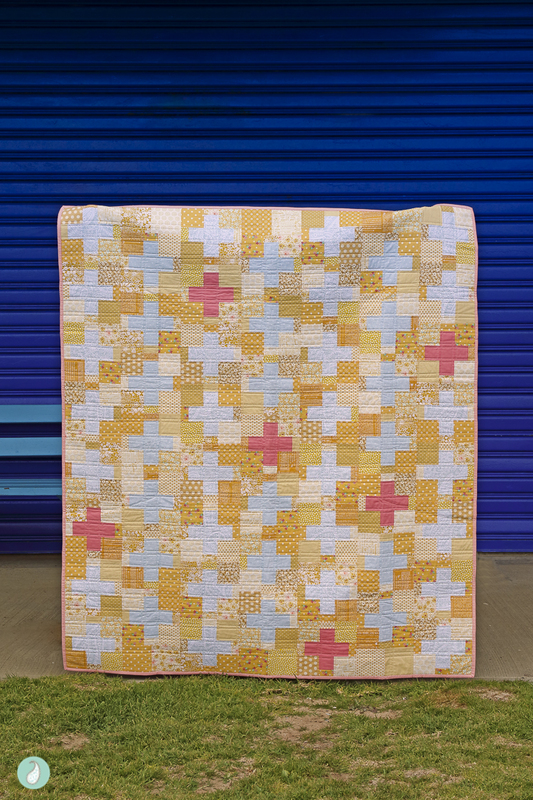 After 22 months, my Pink Lemonade Swiss Quilt was complete. 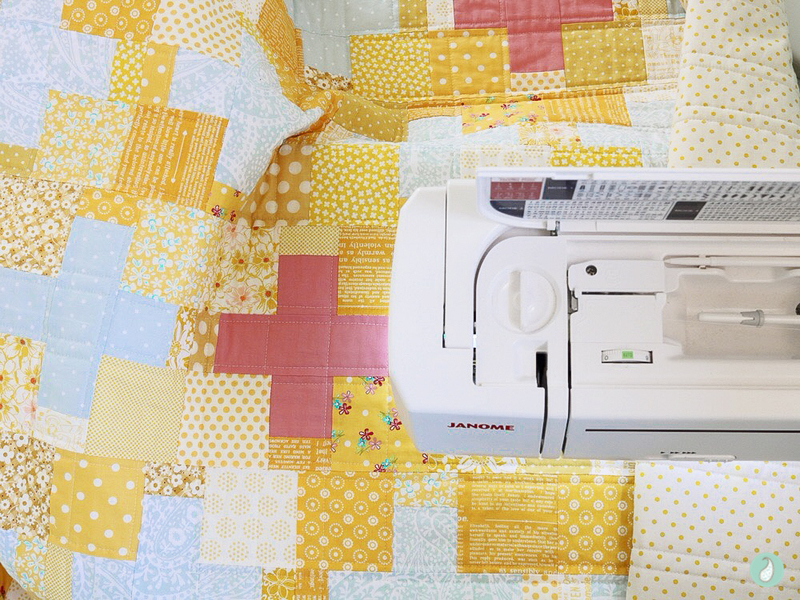 So, as we begin a new year and new projects, I hope we all remember that some quilts take longer than others to make their grand entrance into the world – and that’s okay!! I love your quilt! Scrappy is sooooo perfect!!! 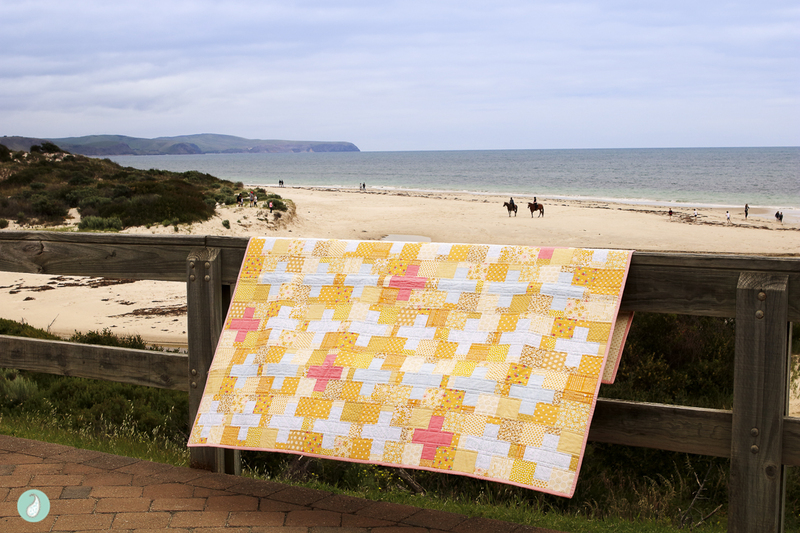 Wonderful and so happy sunshine quilt! I love your version Samantha. It’s so bright and cheerful! 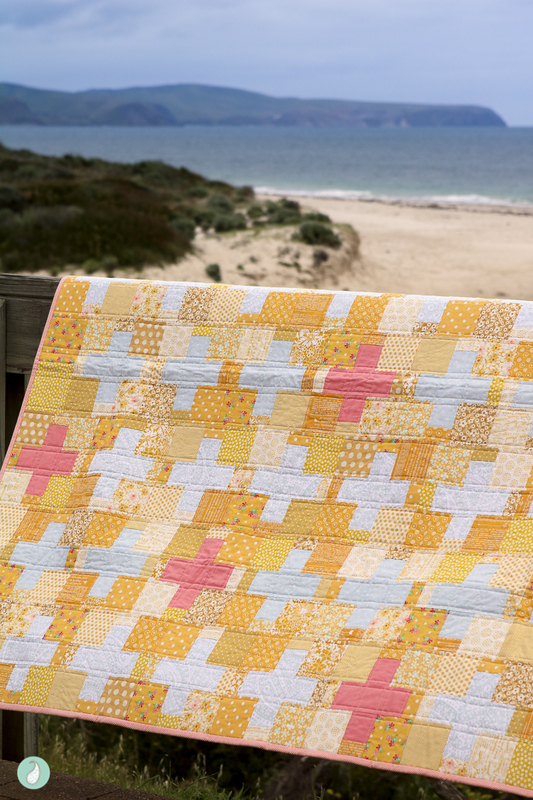 This quilt really is a ray of sunshine – super love the splash of color you inserted here and there. Beautiful finish! !